On December 2, 2015, a California couple walked into an annual holiday party and opened fire on dozens of innocent people. In a break from the norm here at The Firearms Guide, I am going to name the murderers because their names are important. Syed Rizwan Farook and his wife, Tashfeen Malik donned tactical gear, wore facemasks and each carried semi-auto sporting rifles and handguns. One witness said the shooting started as soon as the two entered the room where coworkers of Farook were celebrating the holidays. She said the shooting lasted “awhile”, then paused for about 30 seconds while they reloaded and began firing again. 14 were killed and 17 injured. The killers then tossed a homemade pipe bomb into the room, presumably to kill the rest and first responders (it didn’t go off). Then they calmly walked from the building and slowly drove away in a black SUV. Hours later they were gunned down in a shootout with police. Right away, no facts available, but they’re calling out white men as being killers. 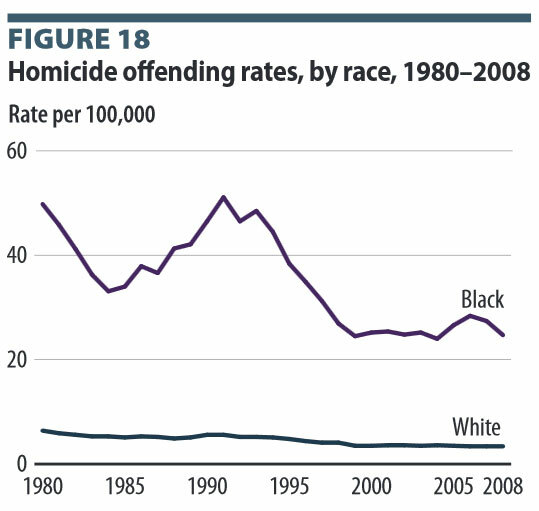 Even worse, suggesting that most gun murders are committed by white males. So, here’s where I address point B above and here is where some people are going to get VERY uncomfortable. 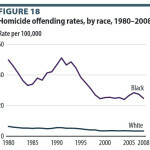 FACT: more crimes are committed by blacks than whites. FBI crime data from 2013 shows that 38% of all murders in the U.S. were committed by black criminals while 31% were white. In the other 31% of cases, race was unknown. Considering that U.S. Census data says that black Americans make up 13% of the population, that is a very disproportionate amount of murders by one race over the other. 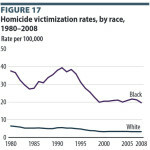 These charts come from the U.S. Department of Justice report on homicides from 1980-2008. 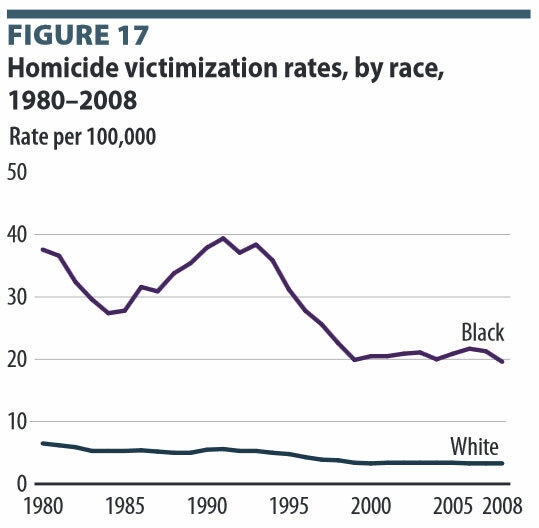 They show both homicide offenders and victims are several times more likely to be black than white. Don’t take just my word for it, FactCheck has done a better job of explaining it than I have. But, just me stating these facts here will get some liberals to call me a racist or a bigot. Yet, they can tweet about suspected white criminals without backlash. That, my friends, is liberal hypocrisy. 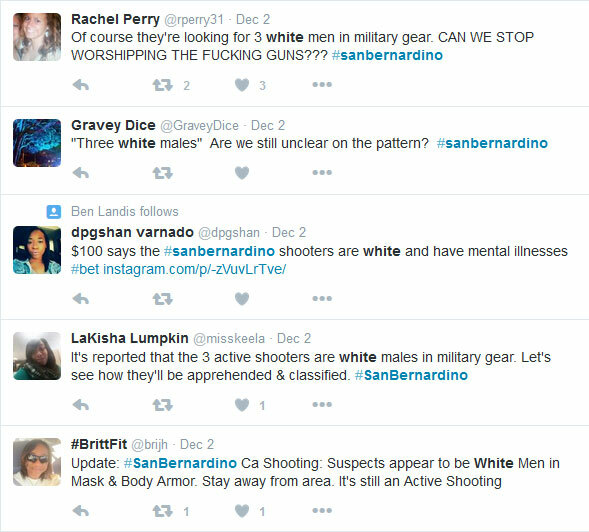 When the facts were revealed late Wednesday night about the true identity of the killers in San Bernadino, the liberal media were VERY slow to release the Arab name of the male suspect. They wanted to “err on the side of caution” before suggesting this was some kind of Islamic Terrorism. CNN and MSNBC wouldn’t even say “Islam” or “Terror” that night. As more facts came out on Thursday, it became clear that Farook was a radical Islamist and that he and his wife had a stockpile of weapons including homemade bombs in their home. In fact, in this detailed account of the terror attack, it is suggested that law enforcement had Farook’s name as a suspect within minutes of arriving on scene. Yet it wasn’t released to the public for more than five hours. Where are the mainstream media on that news? “Well we can’t rule out workplace violence yet,” one outlet put it. Well, as of 11:30AM PST today, the FBI are officially calling this horrific act Terrorism. The evidence is still coming in, but the female suspect had pledged allegiance to the leader of the Islamic State just before murdering innocent Americans. This was a Radical Islamic Terror attack. Period. Whether it was an orchestrated or planned attack by ISIS is yet to be determined but ISIS is already praising it on Twitter. The point, still, is that while CNN and liberal mainstream media claims to prefer to err on the side of caution now, they didn’t hesitate when the news first broke to report that the killers were supposedly white males. For hours after the attack happened that was still the story: three while male suspects. Why? Why would the media or anyone automatically assume the killers were white males given the few factual details we did know? The last several high profile mass murders by gunmen in America were carried out by single individuals not wearing masks. Most of them stayed put until police arrived or killed themselves before then. In most cases, those killers wore plain clothes and did not seem extraordinarily organized. This time, though, in San Bernardino, the killers wore tactical vests and black masks in black clothing and they left the scene. Right from the start this wasn’t the norm, but the media assumed it was the same story as the others. 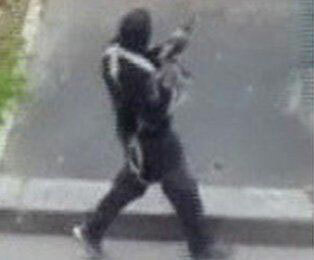 Black clothing, black masks, planned, tactical – this seemed more similar to the Charlie Hebdo attacks and the recent Paris attacks. Yet the media and politicians have held out and, even now, many are refusing to use the words “Islamic Terror” to describe this attack and instead are focusing on gun control. Once again, a fine example of liberal hypocrisy at its worst. I’m sure Obama and his ilk were horrified to find out these killers were not crazy, conservative, white guys. Anything else doesn’t fit their narrative. We need to call this what it is: Radical Islamic Terrorism. Whether or not these people had any direct connection to ISIS or another organized terror network, the fight is now here America. The fight is on our soil now and I suggest you prepare for it. Because those that are ignoring it in an effort not to offend anyone are only helping the terrorists win.